The Rover 29 Cruiser would be ideal for a couple or a single skipper. In the last SketchBook, I wrote about the Rover, a 29-foot, double-ended design. 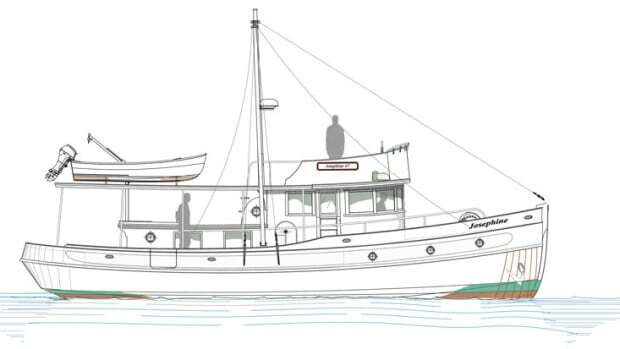 I drew her as an aft-house, Halibut-profile cruiser, but while working with the hull lines, I realized that several house configurations might be applied to the same hull. Hence, this month’s Cruiser version of the Rover. 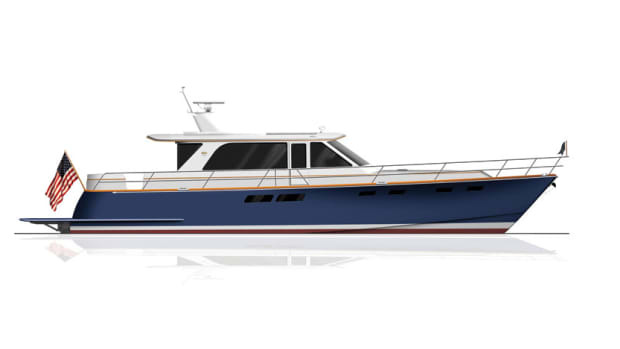 The Cruiser has a double-ended hull with freeboard that’s modest but not at all the likes of what’s normally found on the high-sided and deep vessels that are becoming more common these days. 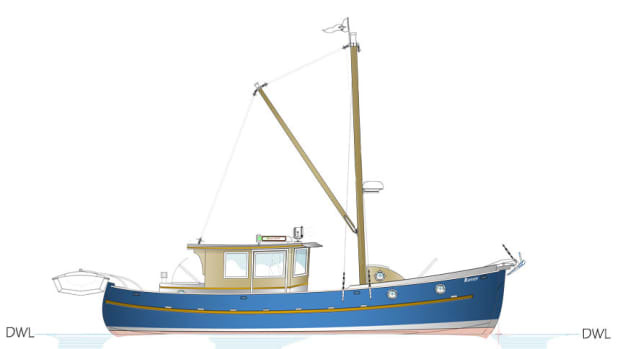 There is a nice balance to the ends of this boat, with enough bow forward to blunt the waves and the stern low enough to allow easy boarding from a dock or pier. 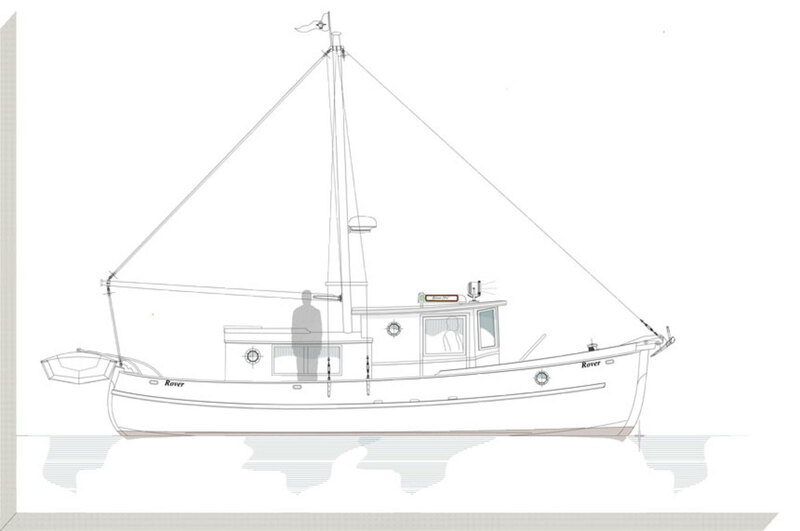 The houses are unbalanced, with the pilothouse forward having side decks and sliding doors to port and starboard. 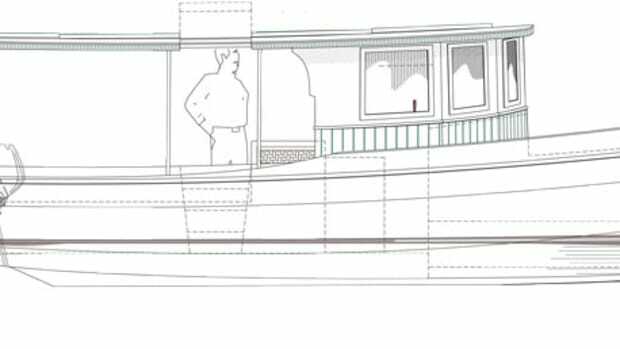 The after house is almost the full beam of the boat, with only 7-inch-wide side decks (just enough to allow for setting the fenders). Handholds on the housetop help with moving forward from the narrower to the wider side decks. 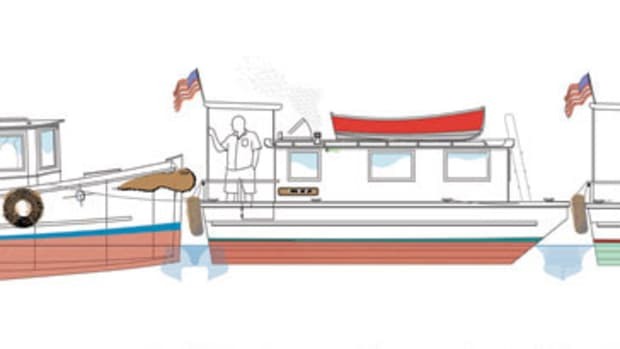 But most of the moving from bow to stern will happen through the two cabins in the middle of the boat. 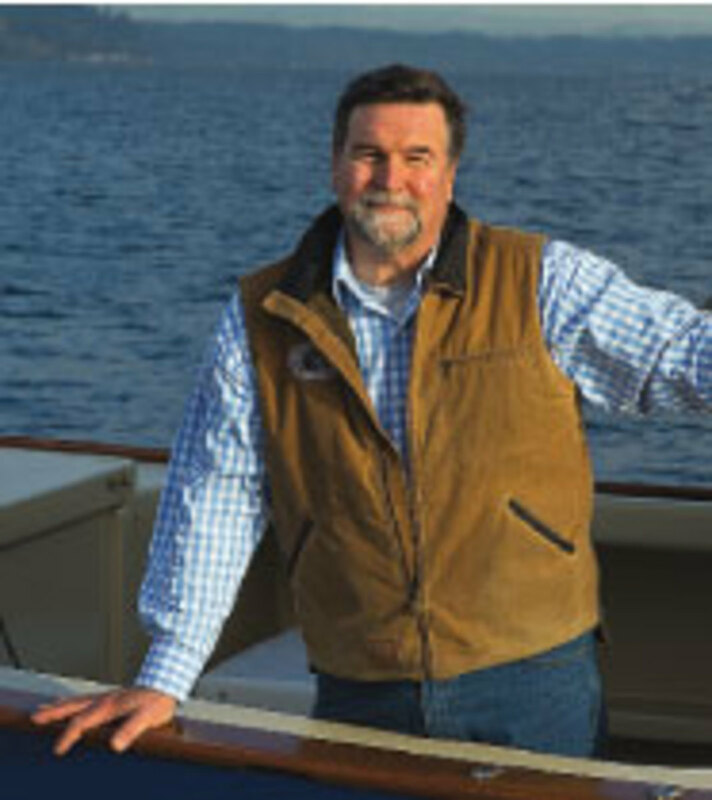 On the aft house is a sliding hatch that leads to a companionway on centerline, giving access from the cockpit and making passage forward into the pilothouse clear and easy. 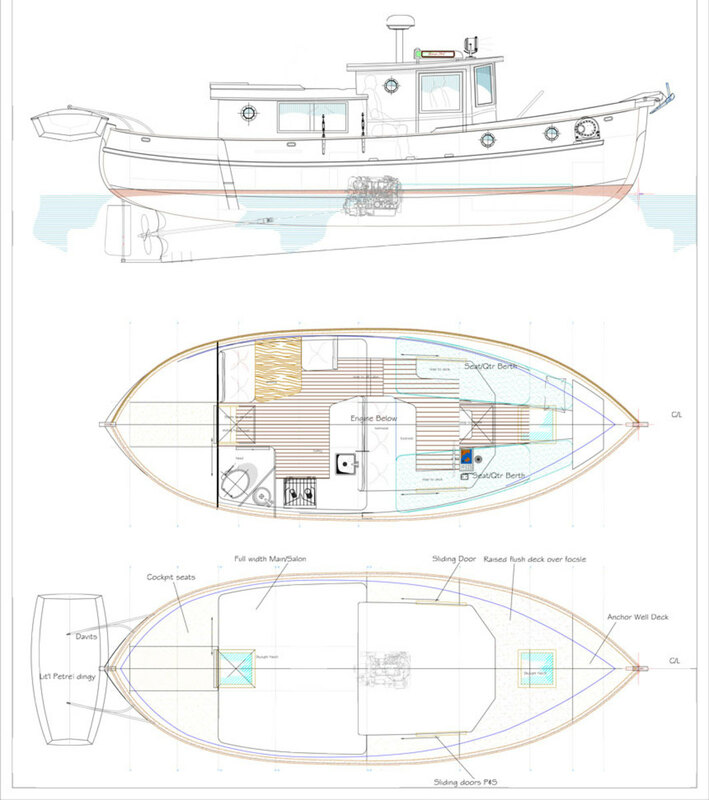 This full-beam house aft allows 6 feet, 4 inches of headroom on the centerline, and a cabin with a head, galley and fore-and-aft dinette. The head has standing headroom, and while it is a wet head with a handheld shower, I would prefer an outside shower in the cockpit. Though I always take at least one shower a day ashore, while cruising I shift gears to showering every other or third day. Looking forward to those cleanup days becomes an enjoyable part of the cruising experience, and with a cockpit shower, I can splash around without introducing extra moisture to the interior of the boat. Life on the water is exactly that, with the whole atmosphere just barely tilting toward dry. If the waters are rough, there is a fair bit of salt in the air, and salty air is a real draw for moisture. The farther north you cruise, the lower the daily temperature, and the more moisture there seems to be in the air. This is one reason why I so often prefer a small wood stove in my own boats. A tiny, short fire each evening after the suns falls below the horizon helps to dry out the air, converting what could be a crawl into damp bedding into a much warmer night’s sleep. On this boat, sleeping is in the fo’c’sle with centerline access from the pilothouse. Stowage is forward of the port- and starboard-quarter berths, whose platforms are long enough to stow duffels. For getting up midevening to check the anchor, I don’t need to wake up the first mate with this arrangement. The Rover 29 Cruiser’s engine would be below the raised pilothouse sole. 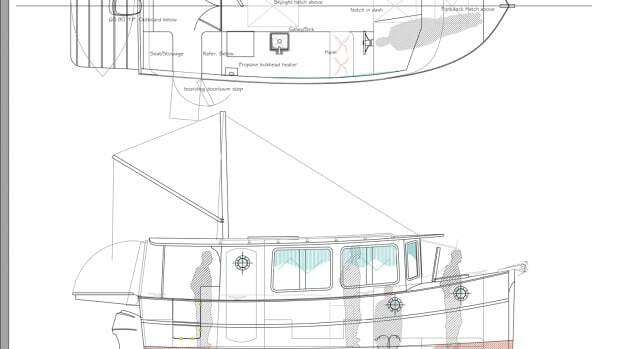 Access would be from above in the pilothouse and aft from the galley, via a removable countertop. 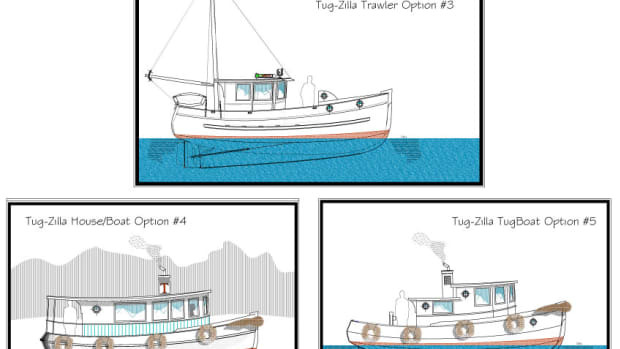 The same 110-hp diesel that I was thinking of for the Halibut version should give the Cruiser version good thrust, with a 2.6:1 gear ratio and a fairly large wheel, to help with close-quarters handling. A small bow thruster could provide a little boost when the wind and tides don’t cooperate. She is displacement in her hull design, and at a speed of 7 knots, the per-hour fuel burn should be in the 1½ to 2 gallon range. At 6 knots, you might cruise all day and not burn 8 gallons of fuel. Dinghy access would be off the stern. With a tall mast, a steady sail and a cockpit boom cover, she should give great comfort at sea and at anchor. 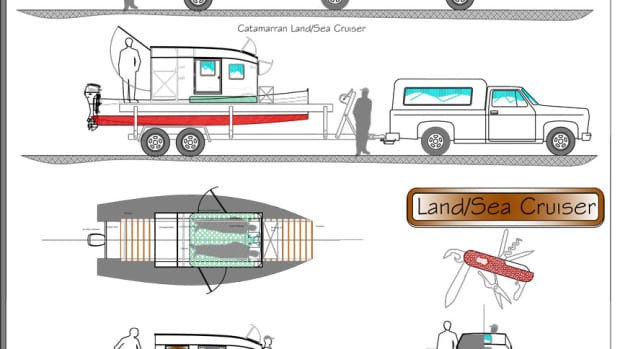 The low-windage “no mast” version might make the Cruiser ideal for a couple or a single skipper doing the Great Loop or the Northwest Passage to Alaska.